There’s nothing like a healthy, delectable loaf to satisfy your palate. Contrary to popular belief, a lot of carrot loaves are actually bad for you. In my younger years (before I knew any better), I erroneously believed that carrot loaves were a healthier alternative to conventional cakes you would buy for dessert. I mean, they contain CARROTS, which are loaded with vitamin A and keep your eyes in good health. What could be better for you? Unfortunately, the amount of sugar used to bake most carrot loaves pretty much cancels out whatever nutritional value you were hoping to get out of that vegetable. I was super bummed to learn that a single piece of carrot cake can contain over 300 calories and more than 16 grams of fat. No wonder it tastes so good. Thanks to the recipe below, I can now indulge in one of my favourite desserts guilt-free. 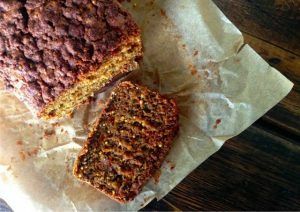 This gluten-free, vegan carrot loaf recipe is packed with ingredients that come with numerous health benefits, unlike some of the ones you might find in your traditional carrot loaf. Instead of using granulated sugar, this recipe uses coconut sugar. Coconut sugar comes from, you guessed it, coconuts and is able to satisfy your sweet tooth without being as high on the glycemic index as regular table sugar. While it’s no miracle food, it does offer some nutrients, most notably Iron, Zinc, Calcium and Potassium. Iron is extremely essential to your health as it helps transport oxygen throughout the body. Without this oxygen, our bodies may become tired, resulting in fatigue and decreased brain function. The other three minerals also contribute to your well-being by strengthening your bones, supporting your immune system and protecting your body from heart problems, and conditions like constipation and high blood pressure. Furthermore, this nutritious recipe includes zucchini. Zucchini contains next to no calories and has been found to help you lose weight. It also has a significant quantity of vitamin C whose anti-inflammatory properties can help protect you from swelling or bruising easily. Now that you’ve been introduced to this healthy loaf recipe, go on and reap the benefits. This recipe is from http://www.youngandraw.com and has been used with permission. If you prefer your loaf to be more savoury, leave out the streusel. 3. Whisk together the flax/chia seed and 3 TBS of water let stand for 5 min. 5. Blend all dry ingredients together and set aside. 6. In a small bowl put all the streusel ingredients and mix together with a fork until crumbly. 9. Pour batter into loaf pan or muffin tins and bake for approximately 50min or until a toothpick comes out dry from the centre of the loaf/muffins. Is it possible to get nutritional and caloric info on all of these recipes? Is it recommended to take turmeric paste mixture at bedtime, or would that put too much stress on the body in digesting it ? I read that it’s a brain tonic & s/b taken at night. Hi I would like to know what I can substitute the orange with? Can i substitute flour with coconut flour?